You want your writing to have a clear message. You want it to be easy to read and reach more people. But your pieces aren’t getting a lot of engagement, and your readers are confused about your main points. You’re having to verbally explain to people what you wrote, and you’re getting fewer and fewer responses to your novel-length emails. 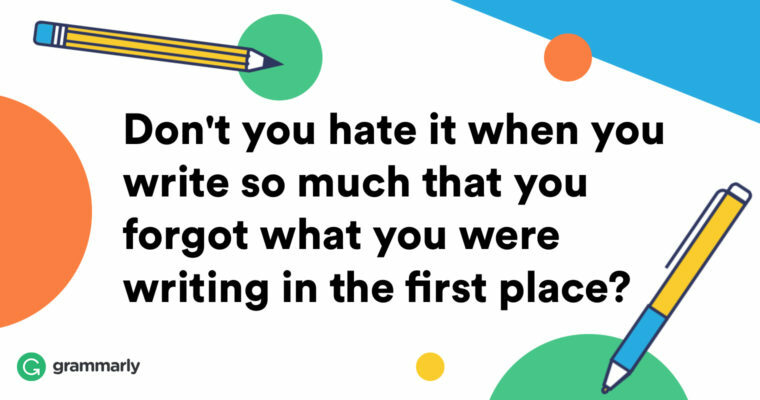 Maybe you were aiming for your next writing piece to be strong, effective, and easy to understand . . . only to end up with a meandering piece of work whose true message is vague or completely unintelligible, as it is so obscured beneath prose that is both confusing and bogged down by adding unnecessary additions that it leaves the reader thoroughly questioning what they have just read and why, if they are even able to doggedly soldier on until the end of the piece, which—I must tell you—is improbable and unlikely. Did you catch all that? Or did your brain zone out halfway through? If you want your writing to inspire, influence, educate—and even entertain—getting to the point is a great strategy. Have you ever read a sentence that was so long that when you got to the end you’d forgotten what it was about? The longer a sentence grows, the more difficult it is for the reader to track what’s being said. You may be writing longer sentences to fit in more ideas, but this can result in your true message getting lost. Resist the urge to jam too many ideas or details into the same sentence. If your sentence is so long that its meaning isn’t clear or you’ve switched topics partway through, consider breaking it into two new sentences. Example: For a writer, it’s important to find that special spot where you can be your most creative, whether that’s a coffee shop, library, park bench, or cozy chair, because this allows you to unlock your imagination and do the work you’ve dreamed of. Solution: For a writer, it’s important to find that special spot where you can be your most creative, whether that’s a coffee shop, library, park bench, or cozy chair. This allows you to unlock your imagination and do the work you’ve dreamed of. We use these words to pad our writing, but when we use them too much they start to bog down our sentences and blow up our word count. They can even become a writing tic with overuse. I actually have to stop myself from using the words “actually”and “just” in just about every other sentence. Want to recognize common filler words? Here’s a handy list of words and phrases you no longer need. Is your writing specific, descriptive, and direct? Or do you get feedback that it’s too vague or wordy? To get precise with your writing, you may need to use more words (to be descriptive), or fewer words (to simplify). Vague: My mom’s aunt has some stuff for sale. Precise: My great-aunt has a bookshelf and a writing desk for sale. Concise: The Three Little Pigs lived in a brick house. Avoiding redundancy is also key to precision in writing. Have you ever had an “unexpected surprise” or met a “very unique” person? Phrases that say the same thing twice are called tautologies. We may think we’re getting more specific, but in reality we’re using redundant filler words. You can learn more about tautologies and tidying up your writing here. You may have heard that it’s always better to use the active voice, but the passive voice is also a great tool. The key is to use whichever voice will do the best job at communicating the meaning of your sentence. The active voice can help your writing feel more direct and energetic. It’s a great way to quickly make your point. Say you’re writing a blog post about the actress Viola Davis. The active voice clearly showcases her accomplishments. Active: Viola Davis won the Oscar for Best Supporting Actress. But what if you’re writing a recap of the 2017 Oscars? For that same piece of information, it could be more direct to use the passive voice because your primary focus is on the award—rather than the actress who won it. Passive: The Oscar for Best Supporting Actress was won by Viola Davis. In general, using the active voice will infuse your writing with greater energy and clarity, but sometimes the passive voice will be your best choice, depending on which part of the sentence you want to emphasize. Still not sure when to use the active vs. passive voice? You can learn more here.